Let's chat with novelist Janice Hanna Thompson, author of Love Finds You in Groom, Texas (Summerside/Guideposts, June 2011). Janice Hanna (also published as Janice Thompson) has published more than seventy novels and non-fiction books. She has also published more than fifty magazine articles and several musical comedies for the stage. 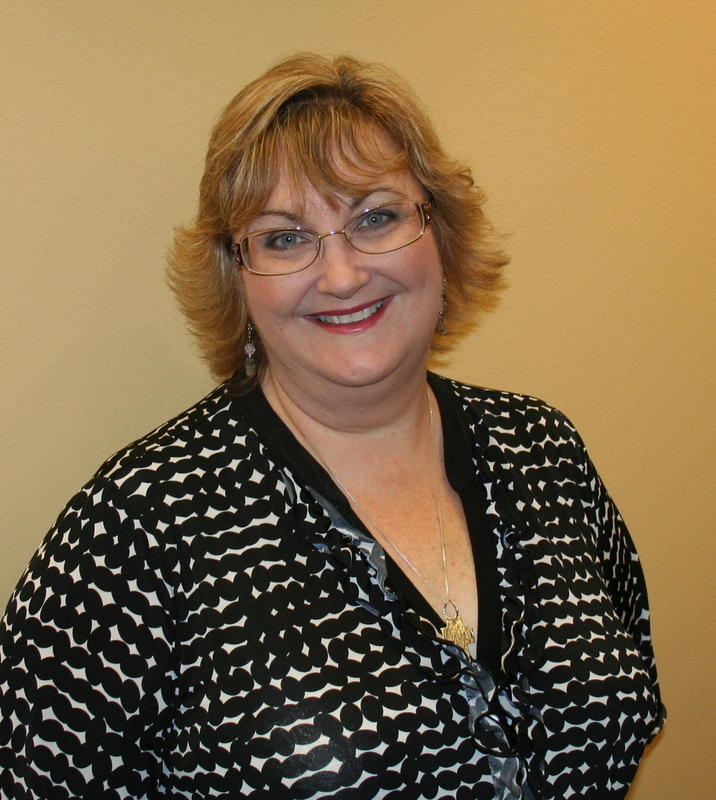 Janice makes her home in the Houston area near her children and grandchildren. Please tell us three random things we might not know about you. My dad was the president of the University of Houston Cougar Cagers Club, so my birthdays, holidays, etc. were spent at basketball games. Our family traveled to Mexico with the U of H Cougars to watch them compete, which was great fun. When I was eleven, I got to play (for fun, of course) with the Harlem Globetrotters, who came to Houston for a visit. To this day, I love a good basketball game. Please tell us a bit more about the plot of Love Finds You in Groom, Texas. Always the groomsman, never the groom… It’s 1914, and Jake O’Farrell has gained an unusual reputation among the locals: He’s played the roles of groomsman and best man in all four of his older brothers’ weddings, but he’s never been able to find the woman to capture his heart. And now with the upcoming wedding of his best friend, Jake will become the last single man in the town of Groom. Anne Denning has made the difficult decision to move with her sisters to Texas, but a train derailment forces them to seek shelter in Groom, near Amarillo. Mrs. O’Farrell, hopeful that Anne will catch her youngest son’s eye, invites the girls to stay at her home until the train is repaired and ready to pull out. Anne has no idea of the blissful chaos that lies ahead! My editor at Summerside approached me with the name of the town because she knows I write a lot of wedding-themed stories. She wanted something lightweight/fun, and she knew me well enough to know I would enjoy a fun story. The only real question we had in the beginning stage was: “Should this be a historical or a contemporary?” We went with historical because I felt sure the story idea was better suited to the turn of the century. Groom boasts a nineteen-story high cross. More than 100 welders worked together to erect it in 1995. Now you can see why I toyed with the idea of writing a contemporary novel! I wanted to include the cross. Because I went with historical, I decided to give the heroine a small cross necklace to wear, one that symbolizes her faith (and alludes to the “bigger” cross to come). What is your favorite memory of the Texas panhandle region? Just one? I love, love, love Palo Duro Canyon, which is not terribly far from Groom. This breathtaking canyon always surprises visitors because you don’t see it coming! Look to your right and see nothing. Then, a few yards up the road, look to your right again and you see a crevice forming. That crevice deepens, then deepens some more until. . .lo and behold! You’re looking at one of God’s most magnificent “sweeps of a fingertip.” Truly glorious. One of my favorite memories was taking my daughters to see the play “Texas” in Palo Duro Canyon when they were little. We camped overnight in the state park, ate BBQ and saw the show. Amazing! Groom is a wedding-themed book. Why do you write so many stories with a strong wedding theme? I have four grown daughters—Randi, Megan, Courtney Rae and Courtney Elizabeth. Yes, I really have two daughters named Courtney. (Long story!) All four of my girls got married within four years of each other. We’re told to write what we know. I know weddings, trust me! I helped coordinate all four weddings and even worked as a wedding coordinator at my church for a season. I was also tickled to be the “Wedding Planner Examiner” for the city of Houston for a spell. What fun! You’ll see me writing about weddings for years to come, so hang on for the ride! What is it about your lead character that will make your readers care about her? Readers will care about Anne because she’s been through so much and still chooses to move forward. They will also love her relationship with her younger sisters. She’s the only remaining parental figure and takes that position very seriously. Why will readers enjoy your novel? In spite of the lead character’s tough situation, the story is filled with comedic elements. Anne’s two younger sisters are a hoot. So is Maggie (the hero’s mother). She’s an Irish spitfire! I think readers will appreciate the romance between Anne and Jake. It’s filled with all sorts of sweet and comic moments. Why do you like writing comedies with strong take-aways? Comedy is a great outlet. We comedians can get away with a lot more than authors who play it straight. Want the reader to walk away with a little nugget of truth? Couch it in something humorous. I’ve found that light-hearted writing not only suits my personality, it’s the perfect vehicle for sharing the gospel. If you were the casting director for the film version of your novel, who would play your heroine? Because Anne (a one-time socialite from Denver) has dark hair and pale skin, I envision her looking a little bit like the character of Diana Barry in Anne of Green Gables. Diana was played by Schuyler Grant. Tell us a little about your hero? Is he true hero material? Jake is a hunka-hunka Texas man! He’s a railroad man who loves his job, loves his family and loves the heroine. He’s got a great sense of humor, which is perfect for this story, because the heroine’s little sisters are loaded with antics! Jake has a lot to deal with: he’s the town’s last single man, which has made him the brunt of many a joke. His older brothers (all married with children) taunt and tease. Jake can never catch a break. Unless he’s with Anne, of course. Then he catches far more than a break. . .he catches the woman of his dreams! Give us one sentence that shows/tells us something about your heroine as a child. Papa used to say the only ‘buts’ were the ones left behind when a man finished a good cigar. What about your sub-characters? Call you tell us about any of them? I love writing stories with fun sub-characters! Those who read my “Weddings by Bella” series know that I spend a lot of time creating my cast! Love Finds You in Groom, Texas is no different. Some of my favorite sub-characters are Emily and Kate (Anne’s younger sisters). Emily was patterned after Margaret O’Brien’s character in “Meet me in St. Louis.” Lots of fun! Another fun-loving character is Maggie, Jake’s mother. She knows just how to get what she wants! Even sour old Uncle Bertrand turns out to be a fun guy. . .in the end. Are any of your characters patterned after real people? The characters are patterned more after characters than real people. I wanted the overall “feel” of the book to be a bit like that in “Anne of Green Gables.” If the reader is paying attention, he/she will notice a few Avonlea-esque images, including my heroine’s name. There are also a few nods to “Meet Me in St. Louis” in this story, as well. What sorts of transformations take place in this book? How much time do you have? (Ha!) Seriously, there are so many! The heroine, Anne, has been through tremendous losses and struggles with her faith from the get-go. By the end of the story, she is a woman transformed. Likewise, the hero has been through far too much taunting and teasing. He, too, has faced losses. With Anne’s hand in his, transformation comes. Even precocious Emily, Anne’s younger sister, goes through a bit of a metamorphosis as the story progresses. The biggest change of all, however, is in Uncle Bertrand. I don’t want to give away too much. You’ll have to read the story to see for yourself! You always seem to add animal to your stories. Any animals in this one? Yes! Most of my readers know that I’m an animal lover. My two miniature dachshunds, Sasha and Copper, are my ever-faithful companions. They’ve made appearances in several of my books. Love Finds You in Groom, Texas, is set on a ranch in North Texas, so I couldn’t possibly write it without adding animals! The cattle are a part of the story, naturally, but so is the family’s collie, Ginger. My favorite animal/character is Frances, the hero’s mare. He’s so enamored with his mare (and so comfortable talking to her) that he ends up practicing his “love speech” on the mare while working up courage to deliver it to Anne. What are readers saying about this book? Have you had any feedback so far? This delightful tale of romance which emerges out of tragic circumstances is set in a wonderful town called Groom in the panhandle of the great state of Texas. It is a story of tragedy, love, and God's divine hand of providence that enters a situation just at the right time and changes everything. Young Anne finds herself on a train heading to Dallas with her two younger sisters after the loss of their father. When fate intervenes, the trail derails and their future is forever altered. And then there is Jake, the last available young man in Groom who finds himself to be the recipient of many jokes about his situation, especially from his brothers. Jake's mother, Maggie, embodies everything wonderful that Anne remembers about her own mother before she died. Throw in the mixture of the antics of Aunt Bets and the perceived sternness of Uncle Bertrand, and you have a story of new revelations and delightful outcomes. You’ve written other Love Finds You books in the past. Do you enjoy writing for this series? Why or why not? I can’t say enough about this line of books. From the moment the first book released, I fell in love—with the authors, the covers, the stories, the settings. Most of all, I love the concept. Through these stories, the reader can travel all over the country, bouncing from town to town, city to city. Want a serious historical? You’ll find it in the Love Finds You series. Want a humorous contemporary? You’ll find that, too. Want a book set in a quirky, fun town? Yep. You’ll find it in the Love Finds You series. Want a story set in a remote, faraway place, filled with intrigue? You’ll find that, too. I was completely blown away by Judy Christy’s book Wreath, about a teen girl who lives on her own. I can’t tell you the last time a character impacted me like Wreath did. I read the book for endorsement. I’m pretty sure it releases in a month or two. Can’t wait to see what readers think! I just turned in Love Finds You in Daisy, Oklahoma, a fun historical about a single woman in her late 30’s who moves from the Gulf Coast to the landlocked state of Oklahoma to become the director at an orphanage. It’s a love story, of course! She falls in love with the town sheriff, who has adopted two of the unruliest boys from the orphanage. I’m currently writing Wedding Belles, the first book in the Belles and Whistles series for Summerside/Guideposts. Are you a full-time freelancer? I’ve been writing full-time since 2005. I write novels, non-fiction books, magazine articles and a variety of other things. I’m so fascinated with the world of freelancing that I decided to create an online writing course to teach others how to do what I’m doing. What are your favorite things to do (besides writing)? Honestly? I love hanging out with my grandbabies. They grow up so quickly and I don’t want to miss a thing! Maddy is four now. She’s the oldest. Avery is three. Peyton is three. Ethan is two. Boston is one and a half and baby Brooke turned one this week. I love them so very much. They keep me young (and give me plenty of fodder for books). I know that you enjoy teaching. Can you tell us about your online courses? I heard through the grapevine that you direct theater productions on the side. Why theater? I grew up doing musical theater and have always loved it. A good friend of mine (Brenda White) is a brilliant musician, probably the most talented I’ve ever known. She writes some amazing pieces. We co-direct at a local theater. I write the plays (mostly) and she does the music. We hold auditions and then rehearse for about two months. Our most recent production was Zaney Muldaney, on the Road to Kingdom Come. To check out the pictures on facebook, go here. I notice you write under two names (Janice Hanna and Janice Thompson). Why? Those who’ve been reading my romances over the past several years know me as Janice A. Thompson. My joy is mixed with a smidgeon of sorrow as I explain the change in my last name for some of my current releases. In 2006 I lost my father to bone marrow cancer. His last name (Hanna) is my maiden name—and it’s a name that means even more to me now that he is gone. In memory of my father, I use the Hanna name in my historicals. My Revell books will still release under Janice Thompson. I hope you my readers will stick with me, no matter which name I use! I understand you have a new VIP bookclub. Can you tell us about that? Yes, I’m so excited about this, too! I came up with this idea several months ago: Why not create a “club” where members can get each new Janice Thompson/Janice Hanna book as it releases for a set price of $11, shipping included. Books are autographed and mailed out to club members before they ever hit the stores. I also encourage my VIP club members to leave reviews, as they are able, on amazon, christianbook.com and www.barnesandnoble.com. If people are interested in joining the club, all they have to do is shoot me an email at booksbyjanice@aol.com with the words “VIP bookclub” in the subject line and their address in the body of the email. Can you tell our readers about your recent road trip? Where did you go, and why? In May of 2011 I went on a cross-country road trip to twelve different states. The goal, (as it relates to books, anyway) was to hit several key spots where I could speak to writers and teach on the subject of our God-given uniqueness. I also researched several locales for my new “Belles and Whistles” series while on the road. I took my mom along for the ride, and what a ride it was! We spent twenty-three days on the road, traveling from Texas to Oklahoma to Kansas to Colorado to Wyoming to Montana to Washington to Idaho to Utah to Arizona to New Mexico, then back to Texas. We met some amazing writers and readers along the way, and even got to spend a little time with my daughter, son-in-law and grandbabies in Montana. What a blast! Yes, I’m very passionate about my faith, which is why I write Christian books. I could no more leave out the faith elements than I could stop eating chocolate. They are integral…to my stories and my life. I’m a huge believer in stirring up the gifts that God has placed inside of us, which is what I hope to do through my teaching. Any suggestions for writers who are trying to get published? Learn the craft. Take courses. Go to conferences. Do the work. But don’t ever let what you’ve learned rob you of your natural, God-given voice. There’s only one you, after all. Love Finds You in Groom, Texas can be purchased at any number of online stores, as well as my website: www.janicehannathompson.com (front page). Readers can always join my VIP bookclub and get the locked in price of $11 (no shipping) by contacting me directly at booksbyjanice@aol.com. Thanks for spending time with me! I had a blast! 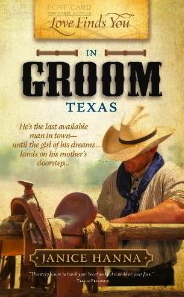 Leave a comment to be entered the drawing for Janice Hanna Thompson's book: Love Finds You In Groom, Texas. Drawing to be held next Monday night. 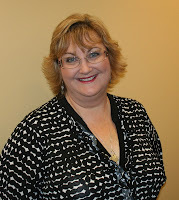 I'm so thrilled to have had Janice here this week - she's the greatest!